University of Southampton innovation incubator Future Worlds is back in Las Vegas for CES 2018. Pioneering researchers and students from the University of Southampton will exhibit their innovations at the Consumer Electronics Show (CES) 2018 in Las Vegas. The world-renowned trade show will offer the first glimpse of inventions launching from ground-breaking research through demonstrations in Eureka Park, where Southampton’s Future Worlds incubator will lead the UK’s university presence at CES 2018. University entrepreneurs will be giving live demonstrations of three featured products at CES 2018: an immersive 3D audio soundbar, an artificial intelligence powered video analytics platform and an intuitive language app to teach the Japanese writing system. Associate Professor Filippo Fazi and Research Fellow Dr Marcos Simón will demonstrate Soton Audio Labs, a groundbreaking system that creates immersive 3D audio from a single soundbar. The technology uses image processing with a built-in camera to track the location of the viewer in the room, and delivers a perfect 3D experience using destructive and constructive sound cancellation techniques. Computer Vision expert Daniel Martinho-Corbishley will showcase Aura Vision Labs, a cloud-based video analytics platform that harnesses the latest innovations in artificial intelligence to generate valuable data for uses in high-tech retail and future smart cities. The platform, which is built on cutting-edge PhD research, uses state-of-the-art ‘deep learning’ technology to extract useful information about how people look and move from live footage captured on low-cost cameras and existing security systems. Web scientist Travis Ralph-Donaldson will bring a hands-on demonstration of Handy Kanji, an iOS app that gamifies the teaching of the Japanese writing system. The application uses intelligent stroke recognition and scoring algorithms to teach hundreds of Japanese Kanji characters. 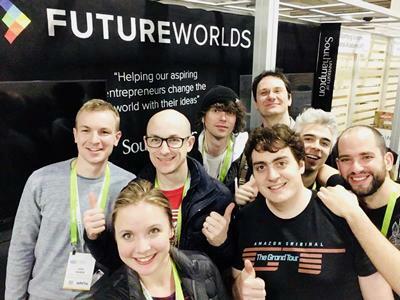 Future Worlds is the on-campus startup incubator at the University of Southampton. Since its launch in 2015, Future Worlds (futureworlds.com) has been helping entrepreneurs launch groundbreaking startups with origins ranging from cutting-edge collaborative research through to student projects. Thirty UK startups will exhibit in Eureka Park this month with 10 featured in the Great Britain and Northern Ireland pavilion, supported by the UK Department of International Trade and sponsored by techUK, the trade association for the UK technology industry. Keep in touch with all of Future World’s activities at CES 2018 with daily blog updates and via Twitter and Facebook. Future Worlds will be based on Stands 52315 and 52317 in Level 1, Hall G, of the Sands Expo, from Tuesday, 9 January, to Friday, 12 January, 2018.